Seunghwan Oh … resides in Seoul, South Korea ... Played for the South Korea National Baseball Team at the 2004 World University Baseball Championships in Taiwan, helping his team to a bronze medal ... Nicknamed "Stone Buddha" and "Final Boss." ... Was a member of the Gold Medal-winning South Korean team in the 2008 Summer Olympics in Beijing ... Attended Kyunggi High School in Seoul, South Korea ... Graduated from Dankook University in 2004, where he pitched for two years while recovering from Tommy John surgery. Acquired from Toronto on July 26 in exchange for infielder Chad Spanberger, outfielder Forrest Wall and relief pitcher Bryan Baker ... Went 4-3 with a 2.68 ERA (47.0 IP, 14 ER) and two saves in five opportunities in 48 games as a member of the Blue Jays, before being traded on July 26 … signed with Toronto on Feb. 28 ... Scoreless in 21 of 25 appearances with Colorado, going 2-0 with a 2.53 ERA (21.1 IP, 6 ER), seven walks and 24 strikeouts ... Limited right-handers to a .166 batting average all season, including .159 with the Rockies ... Scored upon once in three postseason appearances, allowing two runs on three hits with four walks (two intentional) and two strikeouts over three innings… pitched 1.2 scoreless innings in the Wild Card game at Chicago-NL. Led the Cardinals and ranked T-10th in the NL with 38 games finished ... Converted 20 of 24 save opportunities...The 20 saves ranked T-13th in the NL...Made only two saves after the All-Star Break (Aug. 18 at PIT and Aug. 31 at SF) ... Pitched on consecutive days 16 times and three consecutive days a team-leading four times ... Pitched a career-high 13 consecutive games (15.0 innings) without allowing an earned run from April 18-May 17 ... Struck out all four batters he faced on May 23 at LAD to tie a career best (3rd 4-SO game) ... Allowed four hits in an outing for the first time in his MLB career on June 11 vs. PHI ... Made only five appearances in September, a personal single-month low ... Ended the season with a six-game losing streak (May 1-end of season), the longest streak by a Cardinals pitcher in 2017 and T-7th longest in the NL ... Surrendered 10 home runs, T-7th most among NL relief pitchers...Seven of those homers were surrendered to left-handed hitters. In his first year in the Majors, led the team with 19 saves, ranking T10th in the N.L. The 19 saves were the 2nd-most by a Cardinals rookie behind Todd Worrell's 36 in 1986...Appeared in 76 games, 7th most among N.L. relievers and the 2nd-most by a Cardinals rookie pitcher behind Mike Perez (77 in 1992). His 79.2 IP ranked 5th among N.L. relievers...Ranked 4th among National League relievers with 104 strikeouts. The 104 strikeouts by a Cardinals reliever rank 3rd in franchise history behind Mark Littell (120 in 1978) & Trevor Rosenthal (108 in 2013)...His 1.92 ERA ranked 3rd among N.L. relievers and his 0.92 WHIP was 5th...His 76 appearances were the 2nd-most by a South Korean-born pitcher (78, Byung-Hyun Kim, 2001), while his 19 saves ranked 2nd behind Kim's 36 in 2002...Posted the lowest ERA by a South Korean-born pitcher in MLB at 1.92, pitching a min. of 70.0 IP...Struck out the side on six different occasions. Fanned a career-high four batters twice (8/11 & 8/14 at CHI)...His first Major League strikeout victim was David Freese (looking) on Opening Day at Pittsburgh (4/3)...Picked up his first Major League win with a perfect 7th inn. as part of St. Louis' come-from-behind 12-7 win at Atlanta (4/10)...Retired the side in order to collect his first Major League save in 3-0 win at Milwaukee (7/2)...Saved both games of 7/20 doubleheader vs. SD, the first time by a Cardinals pitcher since Jason Isringhausen in 2004...Had a season high 14.1 scoreless inning streak from 8/3-8/30 over 12 appearances, tied with Seth Maness for the longest scoreless streak by a Cardinals reliever in 2016. Played in his second season with Hanshin of the Japanese Central League of Nippon Professional Baseball…Broke his own JPCL saves record with 41, surpassing the 39 from 2014, but tied for the league lead in saves with Tony Barnette of the Yakult Swallows…Led the league with 54 games finished…Named a Nippon Professional Baseball All-Star for the Central League. Made one appearance in Game 2 of the series, tossing a perfect 9th inning as Central swept the series 2-0 with an 8-3 win. Signed with Hanshin of the Japanese Central Baseball League on November 22, 2013, and played the first of two seasons...established the JPCL saves record with 39, setting the mark for saves by a Korean player in Japanese League play ...was named Top Closer in Japan...earned Climax Series MVP honors with a solid performance nailing down three saves vs. Yomiuri Giants in a four-game sweep...surrendered a walk-off three-run home run to Akira Nakamura in Game 4 of the Japan Series in the bottom of the 10th...pitched 3.0 scoreless innings in relief vs. Hiroshima in Game 2 of Stage 1 in the Climax Series of a scoreless 12-inning tie. Became the youngest and fastest pitcher to 250 saves on 4/7/13 (30 years, 8 months, 23 days; 398 appearances). WORLD BASEBALL CLASSIC: Made three relief appearances for South Korea in the World Baseball Classic...did not allow a baserunner over 2.2 innings with six strikeouts and one save, finishing all three games pitched. Made 54 appearances and led the KBO with 47 saves, matching his previous league record in 2006...posted his lowest single-season ERA mark with an 0.63 ERA over 57.0 innings... became the youngest and fastest pitcher to 200 saves on 8/12/11 (29 years, 11 months, 28 days; 334 appearances)...surpassed the World Record at 334 games (previous mark was 359 games) ...saved 28 straight games, establishing a new Asian saves record on 9/27, surpassing the mark of 22 by Kazuhiro Sasaki. A right thigh muscle strain limited his season to a singleseason low 16 appearances...saved four games and struck out 19 over 14.0 innings. Pitched in only 35 games due to right shoulder muscle strain...averaged 14.50 strikeouts/9 IP over 31.2 innings with 19 saves. WORLD BASEBALL CLASSIC: Made two relief outings for South Korea...allowed two runs on three hits over 1.0 inning. Led the KBO with 39 saves, his third straight season leading the league...struck out 51 batters over 57.2 innings, his first season in which he did not average over a strikeout per inning...named a KBO All-Star. Posted his second straight 40-save season, leading the KBO...named a KBO All-Star...nailed down his 100th career save vs. KIA Tigers on 9/18...became the fastest player to reach 100 saves in KBO history at 180 appearances. Set a new KBO and Asian saves record with 47...also led the league with 58 games finished...named a KBO All-Star... helped lead Samsung to a Korean Series championship...struck out 109 batters, his second straight season with 100 or more strikeouts, averaging 12.37 strikeouts/9 IP. WORLD BASEBALL CLASSIC: Appeared in four games for South Korea, all scoreless relief apps....recorded one save and finished all four games... struck out three over 3.0 IP allowing only one hit batsman to reach base. Made pro debut in the Korea Baseball Organization as a member of Samsung...named KBO Rookie of the Year... established career-high marks in wins (10), innings pitched (99.0) and strikeouts (115)...nailed down 16 saves and was a KBO All-Star helping Samsung to a Korean Series Championship. 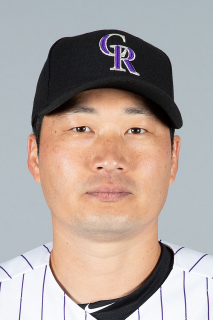 July 28, 2018 Colorado Rockies activated RHP Seunghwan Oh. February 26, 2018 Toronto Blue Jays signed free agent RHP Seunghwan Oh. November 2, 2017 RHP Seung Hwan Oh elected free agency. January 11, 2016 St. Louis Cardinals signed free agent RHP Seung Hwan Oh.